President Obama on Tuesday defended his response to the Orlando terror attack that killed 49 people in a gay nightclub, saying "calling a threat by a different name does not make it go away." "There's no magic to the phrase 'radical Islam,'" the president said, arguing for his refusal to use the phrase 'radical Islamic terrorism.'" "Would it make ISIL less committed to trying to kill Americans? Would it bring in more allies? Is there a military strategy that is served by this?" Obama said. "The answer is none of the above. Calling a threat by a different name does not make it go away. This is a political distraction." While the president did not name Donald Trump, he seemingly directed a portion of his speech toward the presumptive GOP nominee, specifically calling out "yapping" from "politicians who tweet." "That's the key, they tell us; we can't beat ISIL unless we call them radical Islamists," the president continued. In a statement released shortly after Sunday's Orlando shooting, Trump called for Obama to "step down," saying "President Obama disgracefully refused to even say the words 'Radical Islam." "For that reason alone, he should step down," Trump said. "If Hillary Clinton, after this attack, still cannot say the two words 'Radical Islam' she should get out of this race for the presidency." 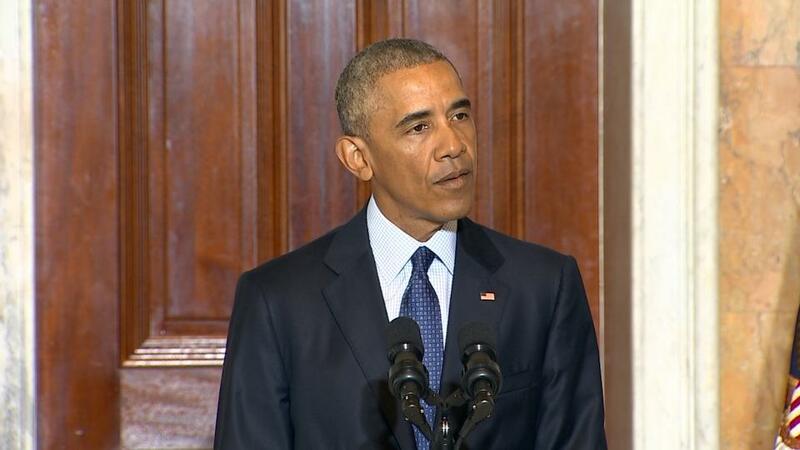 Obama ​touted record of fighting terrorism on Tuesday. "If there's anyone out there who thinks we're confused by who our enemies are, that would come as a surprise to the thousands of terrorists we've taken off the battlefield," he said. The president noted that his administration has continued to describe the enemy as using a "twisted interpretation" of Islam.